6096 Milam Ridge, Sanger, TX.| MLS# 14046563 | Robson Ranch, Denton TX Active Adult community with 100 activities and clubs. Robson Ranch allows the resident to focus on an active mind and a busy body that extends ones live span. Ideal for "empty nesters". Golf Carts Rule. 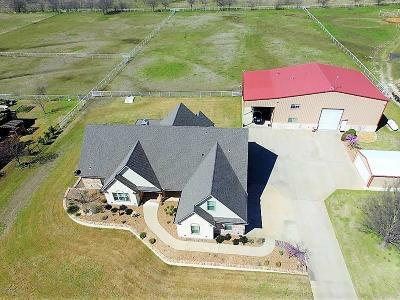 WOW!DREAMING OF A MINI RANCH WITH ALL THE QUALITIES AND MORE OF LARGE ONE?SADDLE UP HANG ON DREAM HAS COME TRUE.RAREST OF FINDS IN THIS CUSTOM BUILT 1 OWNER HOME ON 3 FULL ACRES.HOME FEATURES 5 BEDROOMS 3 BATHS WITH CUSTOM DETAILS AT EVERY TURN INCLUDING THE FINEST OF TILE AND MILL WORK.MAGNIFICENT LIGHT BRIGHT FLOOR PLAN- ALL ON 1ST FLOOR EXCEPT UPSTAIRS BONUS-BEDROOM, CHEF'S DELIGHT DREAM KITCHEN, OVERSIZED GARAGE, AND MORE...PLUS.. APPROX 70X40 BARNDOMINIUM DESIGNED AROUND INTERIOR AND EXTERIOR R.V. STORAGE PLUS APPROX 830 SQ FT EXQUISITE GUEST APARTMENT..PLUS.. APPROX 500 SQFT CUSTOM OFFICE.PLUS APPROX 20X20 ADDITIONAL 2 CAR GARAGE LIST GOES ON.BE MESMERIZED BY THE CHARM AND LASSO THIS ONE BEFORE ITS GONE!